Bondville: Super-chic Logitech Case+ for iPhone and cool UE Mini Boom speaker giveaway! Super-chic Logitech Case+ for iPhone and cool UE Mini Boom speaker giveaway! I love my mobile. And I'm happy to have finally found some slick accessories for it that are beautifully-designed and functional too. The folks at Logitech recently sent me three products from their new super-chic case+ range for iPhone 5/5S to trial. I immediately fell for the case+drive phone mount for the car and my husband snapped up the case+energy spare battery pack (he just had to have it). The system starts with a case+ iPhone case with magnetic panel on the back. 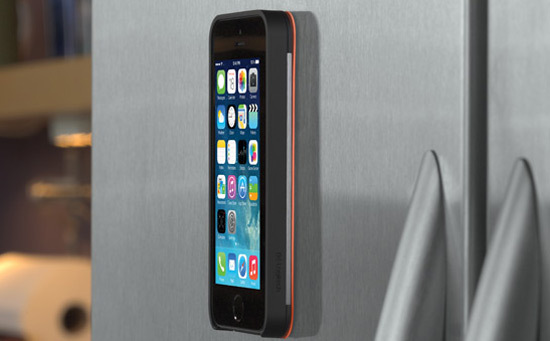 The magnet connects the phone with accessories in the range, and also means you can pop your mobile up on the fridge (or any other metal surface) to use as a timer or to read recipes. This product really has made a huge impact on my life. I was forever fumbling for my phone in the car (while stopped of course) and couldn't view my beloved Google Maps directions while driving. 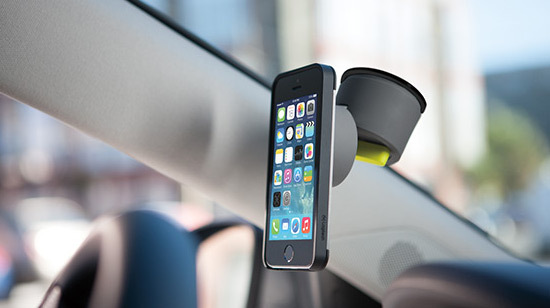 The case+drive magnetic phone mount has an uber-cool design, and works like a dream. I literally jump in the car and touch the mobile to the mount and it's securely attached (no messing with awkward clips and cradle on traditional mounts). It's perfect for using bluetooth in the car and I'm not distracted by alerts on my phone in my bag. Love it to bits. It also comes with a metal patch to pop inside your phone case if you don't have an iPhone 5, or for a second family phone (any brand). Perfect. If you've ever been stuck with a low battery and no charging cable or outlet, you might like the case+energy. You can boost your mobile's battery level by clicking the spare battery onto the case+ cover. The case+tilt system is a folding panel stand for the iPhone that allows you to view videos or images in landscape view hands-free. The coloured panels snap on to the magnetic case+ back. You could even set up your mobile as an alarm clock. And double duty - the folding panel can be used as an earbud cord wrap. 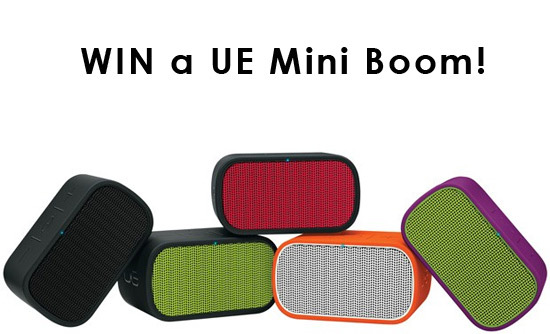 WIN a hot UE Mini Boom Speaker! Now for the fun part. One reader will win another design-friendly product from Logitech - the super cool UE Mini Boom bluetooth wireless speaker, valued at $99. These guys are hot right now. The UE Mini Boom is compact but has huge sound - great for music on the go (parties in the park!) or as a crystal-clear speaker phone. I want the one in orange please! Simply choose your favourite Logitech product and comment on the post on the Bondville Facebook page how it makes your life easier. Closes 2nd March 2014. 1. This is a game of skill. Entry via comment on the giveaway post on the Bondville Facebook page with your favourite Logitech product and how it makes your life easier. Winner will be awarded based on the most interesting response. 3. The winner of the giveaway will be chosen by Steph Bond-Hutkin based on the most original answer. 4. This giveaway is open to all Bondville readers in Australia. 5. This giveaway is hosted by Steph Bond-Hutkin via the Bondville blog at blog.stephbond.com and on Facebook at facebook.com/bondville. 6. The prizes consists of one 1x UE Mini Boom bluetooth wireless speaker valued at $99 from Logitech. Colour may vary/sent randomly. 7. The giveaway opens on Saturday 22nd February and closes midnight on Saturday 1st March 2014. 8. The giveaway winner will be announced on Bondville on Sunday 2nd March 2014 and notified by Facebook messenger and/or email (if provided). If no reply by midnight 2nd March, a runner-up will be chosen to receive the prize. Winner's name and address will be sent to Logitech on 3rd March 2014 to dispatch the prize. Logitech have just launched a new product range. The product is a new case system for iPhones which is called Case+. The case is a smart sturdy case for iPhone 5/5S with a metal backing that provides protection. Case+ comes with a variety of accessories to add on to the case. For more information and stockist details visit facebook.com/LogitechAustralia.